I just arrived home from a five day road trip to Nova Scotia with my good friends Luc and Zal. This year's trip consisted of a tour of the Cabot Trail, the Fortress of Louisbourg, the City of Halifax and the Annapolis Valley region. We started day 1 of the trip with wet weather. Luc and I met for a coffee and hit the road. 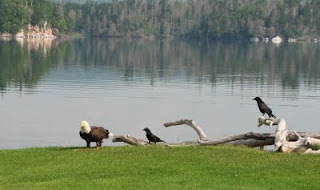 We had about a 90 minute ride on the Trans-Canada highway to meet up with Zal. The ride was wet, but we did not run into any major downpours of rain. On the other hand, Zal ran into some major rain riding from his place via Saint John...so much that he had to stop under an overpass to let the rain pass by. We met at the Big Stop in Salisbury, NB and had a big breakfast. During breakfast, we decided that we would stop at Atlantic Motoplex so that Zal could purchase a set of waterproof boot covers. 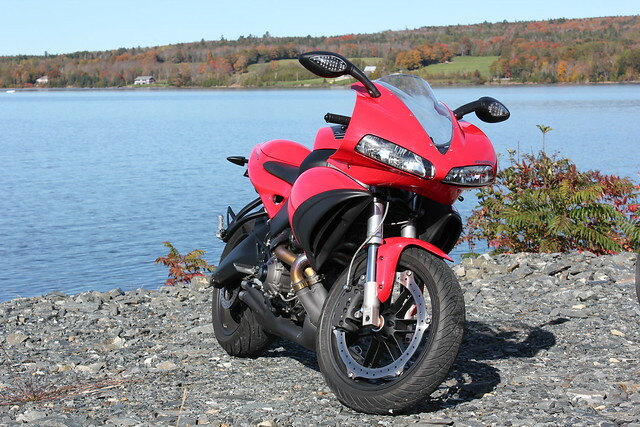 While at Atlantic Motoplex, a salesman tried to sell me a new bike...I was offered a great trade in value for my VStar 1100 Classic, but the timing is not right for a new bike. After leaving the dealer, we proceeded to Amherst, NS. We stopped at a tourist bureau to pick up some literature and hit the road for the Sunrise Trail (Route 6). The roads were fairly good and it was a nice ride. I found that there was not much to see along this route, perhaps it was the wet weather. We did not stop much, so I don't have many pics of day 1. We arrived in Port Hawkesbury at about 6:00pm, checked into hotel, grabbed a bite to eat and relaxed in preparation for day 2, the Cabot Trail. 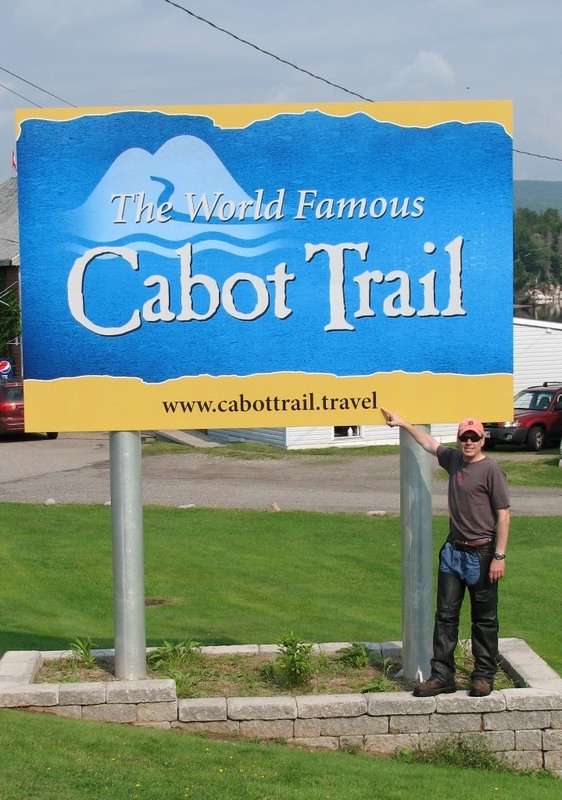 We woke with great anticipation for day 2 and the Cabot Trail. After some research (http://cabottrailbiker.com) we decided that we were going to do the trail in a counterclockwise direction. The weather forecast was calling for clouds & showers, but that did not hamper our spirits. We hit the road around around 8:30 am...the start of the ride was very foggy which is not uncommon, at times it was difficult to see the bike in front of me. We stopped at a local Tim Horton's for a coffee and a bite to eat in hopes that the fog would burn off. We reached the entrance to the Cabot Trail at Saint Anns and by that time, the fog had cleared...we stopped to get rid of some gear and take a few pics. While stopped, we were treated to an unexpected surprise, a visit from a bald eagle. From there it was on to the Cabot Trail...this is a must visit place for motorcyclists. I will let the pictures do most of the the talking...click on pics for a full view. After our stop at the entrance to Cape Breton Highlands National Park, we rode to the Coastal Restaurant...bikers are always welcome and the food is great, especially the coconut cream pie! The ride took about four hours and was one of the best rides I have been on. After our cruise around the trail, the weather turned and it was back to the rain gear. We then rode the 80km to Sydney, Nova Scotia where we setlled for the eve. After unloading, we decided to go to the Sydney Casino for a bite to eat and some gaming. Zal was the night's big winner, walking away with $140.00. Overall, it was a fantastic day of motorcycling, with wonderful scenery and great riding partners! I will post Day 3, the Fortress of Louisbourg soon! Awesome job with great pics. I love Nova Scotia and your blog reminded me of how beautiful it really is. Huge contrast to where I'm at--flatlands of Central Florida. What a great adventure. Love that trailer too. There's one for sale on my ride home, might have to check it out. Love the bald eagle and the submarine pictures. I really need to find a way to get in on one of these trips..